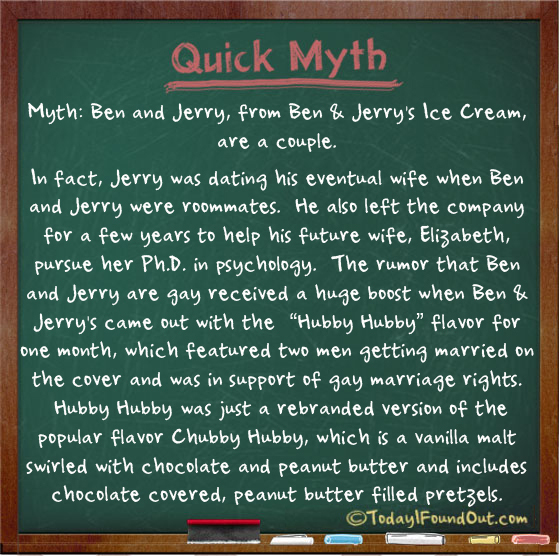 Myth: Ben and Jerry, from Ben & Jerry’s Ice Cream, are a couple. In fact, Jerry was dating his eventual wife when Ben and Jerry were roommates. He also left the company for a few years to help his future wife, Elizabeth, pursue her Ph.D. in psychology. The rumor that Ben and Jerry are gay received a huge boost when Ben & Jerry’s came out with the “Hubby Hubby” flavor for one month, which featured two men getting married on the cover and was in support of gay marriage rights. “Hubby Hubby” was just a rebranded version of the popular flavor “Chubby Hubby”, which is a vanilla malt swirled with chocolate and peanut butter and includes the chocolate covered, peanut butter filled pretzels.